A university sexual violence victim advocate is available to provide immediate and ongoing support and assistance for victims of sexual assault, relationship violence, stalking or sexual harassment. The advocates are available 24 hours a day, seven days a week and are just a phone call or an email away. Advocacy services is able to keep almost everything you share with them private but not completely confidential. They are mandated to report to the Title IX Coordinator when sexual violence, stalking, sexual harassment or relationship violence has occurred. The victim advocate is available during regular Marquette office hours (8:30 a.m. – 4:30 p.m., M–F) and can be reached by calling (414) 288-5244 or by emailing advocacy@marquette.edu. If you would like to speak to an advocate after hours, contact MUPD (414) 288-1911 and request an advocate. MUPD will have the advocate contact you directly. Referrals to university and community support, and counseling services. Accompany a victim to the hospital or other medical providers. Assistance with housing, academic and other concerns. Assist in creating a safety plan, including helping to obtain a restraining order or university Stay Away Directive. Information about the university’s Title IX policy, reporting and complaint process. Information about and assistance with filing a criminal complaint with the police or taking other legal action. Assistance and support throughout the criminal justice or university complaint process including escorts to all necessary appointments and court proceedings. Advocacy Services will provide support and assistance to victims regardless of whether the victim chooses to file a formal report with law enforcement or pursue a complaint through the university’s Title IX complaint process. Victims will remain in control of all decisions that are made about their healing process and courses of action. 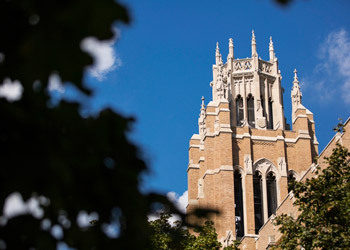 The Advocacy Network consists of Marquette faculty and staff members who have been specially trained to provide support and assistance to members of the Marquette community who have experienced sexual misconduct. This team supports the 24/7 on-call Advocacy Services response. Learn more. Jody Jessup-Anger is an associate professor of higher education and coordinator of the Student Affairs in Higher Education master’s program in the Department of Educational Policy and Leadership. In 2018, she co-edited Addressing Sexual Violence in Higher Education and Student Affairs, a special volume of New Directions for Student Services. Prior to joining the faculty, she spent 10 years as a student affairs administrator, working primarily in gender education and victim services. Tyanna graduated with a Bachelor of Arts in African-American Studies from Marquette University. Currently, she is the Assistant Director of Service Learning at Marquette University. She is responsible for developing and maintaining over 120 community partnerships, managing a student leader staff, and helping faculty and local organizations find mutually beneficial partnerships in Milwaukee. Michael serves as the Residence Hall Director of Schroeder Hall. He enjoys exploring Milwaukee, playing volleyball, and spending time with his cat, Reggie. In addition to being an advocate, Sara oversees the Student Wellness Center located in the 707 Building on the first floor, working with an amazing team of wellness peer educators. Sara’s professional interests include alcohol and drug prevention, bystander intervention, and holistic well-being. Sara’s hobbies beyond Marquette include gardening, swimming, cooking, hiking, and traveling. One of Sara’s goals is to visit every state park in Wisconsin! Laiya Thomas has worked at Marquette University for ten years where she serves as the Assistant Director of Student Support Services in the Educational Opportunity Program. In this role, she works closely with first generation students; helping them achieve their academic goals. She resides in Milwaukee with her husband and two children. In her free time, she enjoys spending time with her family, attending church, reading, and watching documentaries.